Delbert Eugene Lott, 92, of Fort Dodge, passed away on Friday, March 15, 2019, at the Fort Dodge Villa Care Center in Fort Dodge. Private services were held on Friday, April 12, 2019 at the Gunderson Funeral Chapel in Fort Dodge. Burial was in Memorial Park Cemetery with full military honors conducted by the Iowa Army National Guard. Del is survived by his wife, Joyce; a son, Arthur (Lumen) Lott of Oklahoma City, OK; a granddaughter, Lynn (Michael) Byrd and a great granddaughter, Elyssa all of Sierra Vista AZ. He is also survived by a sister-in-law, Marie (Ernest) Blood of Metamora, IL; niece, Tam Blood and a nephew, David Blood. He was preceded in death by his parents; sister, Hildred (Lott) Belmer; brothers, Arnold Lott and Russell Lott; and his constant companion, his cat, “Duffy”. Delbert Eugene Lott, the son of Arthur and Leola (Fryer) Lott was born March 14, 1927 in Fort Dodge, Iowa. On July 29, 1951, Delbert was united in marriage to Joyce Poindexter in Adel, Iowa. Delbert served with the US Army Air Force for 23 months in Europe during WWII. He was on active duty with US Air Force for 21 months during the Korean War and served with the Iowa Army National Guard as a fixed wing and helicopter pilot for 21 years. 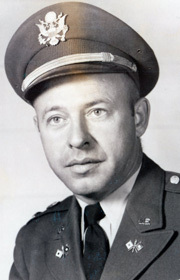 Delbert was employed as a corporate pilot for Gus Glaser. He also was a flight instructor and worked at Celotex until his retirement in 1989.